The key to facial rejuvenation is maintenance. People are realizing now that in order to delay the signs of aging, maintenance programs and skin protection are crucial. Injectables are ideal for the patient who wants to treat wrinkles and folds and with little to no downtime. Most produce an improvement you can see when you leave the office. Dr. Dadvand is an expert in the latest injectable techniques, and personally performs all of the injections himself. Whether it is Botox, Restylane, Juvederm, Perlane, or Radiesse, Dr. Dadvand will go over the benefits and limitations of each filler with you and come up with a treatment plan based on your specific needs. Botox is the most commonly performed cosmetic procedure in the United States. As common as botox treatments have become, it is important to have an expert who understands facial anatomy perform your Botox procedure. Dr. Dadvand has years of experience performing Botox procedures and personally performs all of the injections himself. Botox has been used for cosmetic purposes for over twenty years. While the goal of Botox, namely to reduce wrinkles, is the same as fillers, the way it achieves this goal is completely different. Where the fillers serve to, well, fill lines and folds, Botox reduces lines by acting on the muscles that cause these lines. 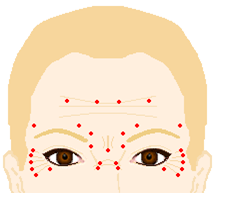 The three most common facial areas treated with Botox are forehead lines (caused by the frontalis muscle), glabellar lines (caused by corrugator muscles), and crows feet (caused by the orbicularis oculi muscle). Other facial areas that are improved with Botox include “bunny lines” on the bridge of the nose, vertical lines around the lips, and the corners of the lips when they start turning downward. Botox can also lessen neck bands that can form in certain people. Botox acts to block the contraction of these muscles. When the muscles can no longer contract then the lines fade. The art to Botox is to be able to leave enough muscle contraction as to avoid the “frozen” look. This is where the experience of Dr. Dadvand, an expert in performing injectables, becomes invaluable. The procedure takes between 15 and 30 minutes and is done in the office with topical numbing cream. Afterwards you may have some redness at the injection sites for several hours. Your only restriction is to not do any strenuous exercise for six hours after the injection. You may begin to see the results by the next day, but on average Botox takes 3-7 days to take effect. Some other areas that Botox is proven to work is in the underarms and palms for hyperhidrosis, or excessive sweating. Botox has also been used successfully in the treatment of certain types of migraines and bruxism, or teeth grinding. Is Botox Safe? Botox is safe. Botox has been used for over 20 years for cosmetic purposes in over sixty countries around the world. It is the number one cosmetic procedure performed in the United States. Allergan Corporation is the only manufacturer of Botox and are headquartered here in Southern California. What is Botox? Botox is a purified protein produced by the Clostridium botulinum bacterium. Botox works by blocking the signals that make muscles contract. By reducing the activity of these muscles, the lines that would be caused by muscle contraction are reduced. How long does Botox last? How long Botox lasts differs from person to person and is affected by things such as the person’s metabolism among other things. Typically, Botox lasts up to 4 months. Once the effects of the Botox have worn, the muscle returns to its baseline activity and the lines return as well. Where is Botox typically injected? Botox is typically injected in the muscles that cause forehead lines, glabellar lines (the lines between the eyes), and crows feet. Is it true that if I keep using Botox, my muscles will get weaker with time? In a word, no. Once the botox wears off, the muscles return to their normal activity. There is no weakening of the muscles over time. What are the side effects? Botox is very safe and has very few if any side effects. Less than 1% of patients may have some bruising at the injection site. It is important to not take any aspirin or aspirin products several days before your botox appointment. There are no permanent medical illnesses that occur with botox use. Less than 1% of patients may experience temporary eyelid drooping or heaviness which resolves on its own. Some patients also notice temporary headaches for the first day or two after the injection. When will I notice a difference? Within days, you may see a marked improvement in the moderate to severe lines. Lines continue to improve for up to a month. Patients saw improvements in their appearance as moderate to better 1 month after treatment.